1. (+) Alera, the Protagonist - Although Alera was at times a bit spoiled, childish, and naive, I liked her as a protagonist. She was stubborn, which made for great tension between her and Steldor, smart, compassionate, and determined. And she matured a lot throughout the book in both actions and temperament so that was nice to watch as well. It somewhat redeemed her in my eyes. 2. (+) World-building - Oh man, if there's one thing I'd have to pick from this book, it would be the fantasy world Cayla Kluver's created. Hytanica and Cokyrian customs, cultures, and the war between them, the dynamics of politics and social pressures with their gender barriers, choosing between duty and living your life... It's all so wonderfully complex, and I cannot wait to read more about it. It's obvious that Cayla Kluver spent a lot of time mapping out the world she's created. 3. (+) Side Characters - Another thing I absolutely loved were the side characters in this story. London's past is such an enigma but still I couldn't help but feel for him as he showed both his protective side and his determination. And the King, the Queen, Steldor, Tavark, Cannan, Destari, Temmerson, Halias, Miranna, Narian's father, Narian--Cayla Kluver did a magnificent job developing these characters. My favorites were probably Cannan, Narian, Steldor, and London, and that's because they're all a bit reserved (well, maybe not Steldor), and I want to find out more about them. 4. (+) The Romance - It's easy to see why Alera likes Narian, given how he treats her so differently than most men treat her. I would've liked to see more scenes between them or at least know why Narian was as attracted to Alera as she was to him, but both don't really fit in with the story given Narian's character and the unwillingness of the Guard to leave Narian alone. So the Alera/Narian romance didn't work as well for me. But there's also the romance with Steldor, which I enjoyed much, much more. Steldor's an arrogant jerk with quite a temper, no doubt about that, and yet he also softens up a bit in response to Alera's repartees. Their interactions were always interesting to read about, and I thought the change in Steldor's demeanor brought a very nice complexity to his character. 5. (+) The Use of the Past - Oh man, I really enjoyed how Cayla Kluver used the past to highlight the fears of the Hytanians now about the war... and how it made her characters so much more compelling. With a war on the horizon, no one can afford to keep secrets else the past repeat itself. 6. (+/-) Frustration - Ah, but I was very frustrated while reading this novel. Because she is a woman and Hytanican society values men over women and requires that women be submissive, Alera is not often allowed to do very much. This became very frustrating as I found that most of the times things were happening around Alera or to her instead of her acting on events. I didn't want her to be submissive. It sort of reminds me of Victorian age novels and how I always want the heroine to conquer the social restrictions... At the same time, I didn't think this was a total negative because it just speaks to the mastery of Kluver's writing that she could get me to feel so frustrated along with Alera, who also wanted to do something, anything. 7. (--) The Ending - And yet I was dissatisfied with the ending. There are a lot of unresolved issues at the end. Granted, this is the first in a trilogy, but I couldn't help but feel that the book could have been more complete or had a more traditional fall and rise plot. 8. (+/-) The Writing - Sometimes I felt like there were too many descriptions. This also stems from my dislike of the pacing, which I'll expand on in a bit.... Anyways, with a nearly 500 page book, I really wondered if some things could have been cut... like the descriptions of the food at the dinners, the gowns at every party, letting us know what everybody was up to.... I understand that this is a fantasy world and a certain amount of details are needed to provide authenticity, but I also found myself wishing that those descriptions were not as lengthy. 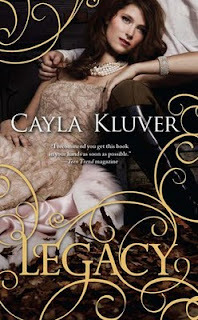 Nonetheless, it would be remiss of me if I did not acknowledge Cayla Kluver's superb writing, which is fluid and replete with imagery; she made it easy to slip into Alera's world. 9. (--) The Pacing - As mentioned earlier... 500 pages... and we do not even meet Narian until over 100 pages have passed, though as the summary of the book tells you, he is rather important. I cannot identify what the climax of this novel actually is--there are several important elements, but it feels more like a constant building of tension, like Cayla Kluver is just establishing her fantasy world. This reminds me of Starcrossed, given that this is the same feeling I got from it. 10. (+) The Cover - I don't usually like overwrought curls as seen above, but their elaborateness only highlights Alera's position as princess and I love the colors of the cover. It may be yet another girl staring at the camera in a YA pose, but if I saw this book, I'd at least check to see what it was about. Despite my issues with the pacing, I still find myself drawn to the fantasy world and side characters that Cayla Kluver has created and will be perusing the sequel, Allegiance, when it is released. The summary already gave away what happened to the baby. It reminds me of Across the Universe. I feel like this book is going to be predictable.